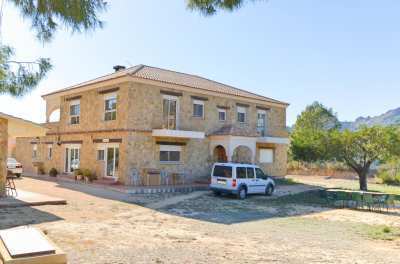 This beautiful finca is surrounded by vineyards and almond trees. Beautiful views to the Jalon valley. 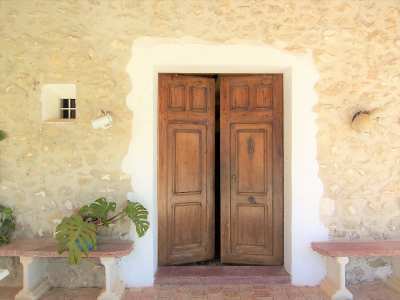 The old part of the finca is ca. 200 years old and tastefully reformed. The newer part is ca. 35 years old and built in the same style. Renovated in 2005 . The 392m2 liveable space is divided in a main house and a separated guest house and a bodega. The ground floor of the main house is 227m2 and consist out of hall, 3 living rooms/dining room, a kitchen, store room, office and two bedrooms with en-suite bathrooms. The first floor of 90m2 has also a salon/ library, bedroom and a glazed -in terrace . The guesthouse has a salon, kitchen and bathroom and bedroom. The third construction is the bodega. This estate of 9000m2 has his own vineyards and produces his own wine! ( Hobby). In the main kitchen there is still a old water well , now covered with glass. The whole estate has romantic corners where you have a breathtaking view towards the valley of Jalon. In springtime a fairytale when the almonds are in blossom, Close to the village Jalon and the town Benissa.